Different faces but the same old story is being replayed in a small part of the Euro-zone, Cyprus, and that story is one of the Cypriot banking crime syndicate gambling with depositor funds on the debt markets, this time it's Greek bonds, yes, these master-eds of the universe used depositor funds to pile into soon to go bankrupt Greece because of the high yields they offered so that the bankster's could bank bonuses on the basis of fictitious profits as illustrated by the fact that they have dumped an infinitely pile of losses (Greek Bond's ) onto Cypriot tax payers, far beyond anything that any other Euro-zone member has had to face to date. The emerging details early Monday morning in the face of a literally eye popping deadline are that of at least 40% of deposits over Euro 100k will be stolen in the two largest cypriot banks, one of them Laiki (2nd largest) will definitely be wound down, many mainstream commentators have jumped onto the fact that the depositors will receive shares in the banks which might be fine if the shares were given AFTER the banks were restructured i.e. bad assets being written down, but they are not instead the depositors are likely to be handed what amounts to worthless toilet paper in exchange for their hard cash. The damage has been done, as the one thing that the banking system relies on has been destroyed and that thing is confidence. No depositor in Cyprus has any confidence in any cypriot bank and will try to transfer out of the Cyprus tax haven at the earliest possibility so there will be a bank run on cypriot banks the unfolding of which will be inline with the capital controls have been put in place. The damage has been done to the Cypriot economy as its biggest industry the finance sector has been destroyed to result in huge job losses. The damage has been done as all businesses have been impacted severely due to both many businesses having had their bank deposits stolen and for Cyprus having become a cash economy, where credit is scarce and not trusted by suppliers, so expect many non finance related business to go bust over the coming months. The damage has been done to the reputation of Cyprus, where it is now seen as a high risk destination for tourists and investors for the reason of perceived instability, just as Greece's tourist industry has suffered. The damage has been done geopolitical as Turkey profits from this crisis as Northern Cyprus is not only stable, but like the mainland is prospering. Also there is the potential for conflict with the suggested sale of Natural gas deposits around Cyprus as they effectively belong to both North and South Cyprus, whilst this does not mean a military conflict it will make investors more reluctant to enter a potential conflict zone given the flammable nature of natural gas. Why Should Germany Bailout the Cyprus Tax Haven? As ever the blame is being leveled at Germany for German tax payers not digging deeper into their pockets to bailout Cyprus as illustrated by the Cypriot born Dragon's Den star Theo Paphitis laying the blame at the Germans for not finding the extra Euro 6 billion rather face the truth that the Cypriot Bankster's and the Cypriot politicians are WHOLLY responsible for the current crisis because this crisis has its roots in actions several years AFTER the 2008 financial crisis i.e. Cypriot bankster's used depositor funds to gamble on Greek bonds and off course lost heavily which is why the banks went bankrupt. Well over a year ago I attempted to map out how euro-zone financial armageddon might play out for the UK that would start with a Bank Holiday that would keep getting extended until the Government had worked out the mechanisms for stealing your savings. The big difference between the UK and euro-zone members is that the UK can and would print an unlimited amount of currency to prevent nominal loss to depositors Cyprus style, the consequences of which would be a collapse in sterling and resulting very high inflation whereas that option has not been available to the likes of Cyprus by virtue of having the Euro so it is forced to outright steal depositor funds. A closure of the banking system (Bank Holiday Month) will result in a huge drain on cash in the economy, therefore I suspect the Bank of England has already secretly prepared itself for this eventually by printing a huge quantity of actual bank notes by the container load, ready to ship out as soon as the crisis bites, which would be necessary to cover a closure of the banking system the effect of this would be highly inflationary, because printing actual bank notes is the same as that which happened during Weimar Germany sparking hyperinflation when people ended up buying loafs of bread with Wheel barrows full of worthless currency, this is what would happen, inflation would go through the roof, forget 5% per year, we would be at 5% per month! So a closure of the banking system would probably not be the worst of what could follow. Similarly the Cyprus banks have been on a Bank holiday since 18th March that keeps getting extended with the latest news suggesting that they will re-open on Tuesday 26th March, though I wouldn't bank on it, given that a bank run by frightened depositors is certain, they will likely remain closed for the whole of this week. Meanwhile the ECB keeps shipping in cash to distribute at falling withdrawal limits from Euro 500 per day to 100 from today per account via ATM cash machines that tend to run dry within minutes of their daily refills. THIS IS HIGHLY INFLATIONARY. As I have explained several times over the year that printing and distributing actual bank notes is the road to Hyper inflation because it sends the velocity of money through the roof as no one wants to hold onto money that is constantly losing its value. Whilst inflation can be contained in Cyprus due to its small economy, however Germany KNOWS from its own experience of what the contagion risks are if the same started to take place in larger Euro-zone nations that would require infinitely more bank notes to be printed in the event of banking crisis bank holidays, which most obviously points to Greece as being next. Therefore the ECB will likely enact severe cash withdrawal limits right across the euro-zone due to the inflationary consequences. Whilst Cyprus dithers its away through the current crisis, this will however set a dangerous destabilising precedent in that bank deposits can no longer be deemed to be SAFE anywhere! for the fundamental reason that it is impossible for bankrupt states to guarantee anything! Let alone 100% of deposits. Instead at the crunch point they will seek to STEAL ALL OF YOUR WEALTH as I originally warned several years ago in the Inflation Mega-trend Ebook of Jan 2010 (FREE DOWNLOAD) (and earlier in articles), which is why people need to seek to protect their wealth by removing it from banks and parking it in assets that are less susceptible to the Inflation stealth theft such as property that I will seek to illustrate again later in this article. 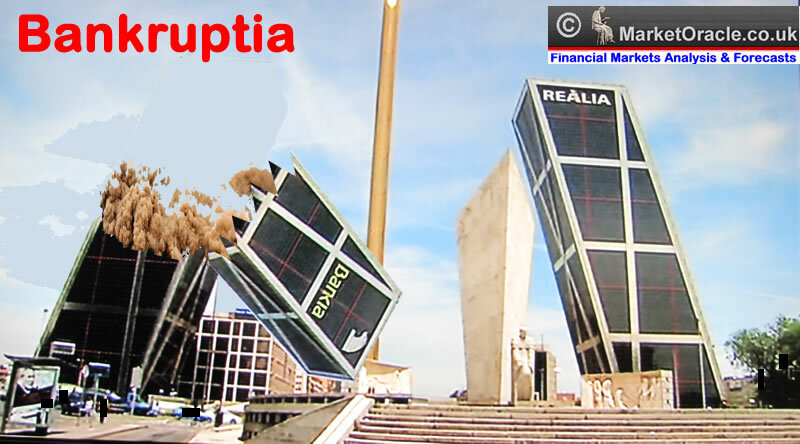 The risk is now of contagion of bank runs spreading across the euro-zone because the likes of Spanish Banks are STILL BANKRUPT! The People of SPAIN Understand this, they also now understand that they could be NEXT to have their savings stolen by a state that cannot guarantee anything! As one thing is virtually guaranteed that Cyprus is NOT the end of the story, for after the bailout of the cypriot banks within a few months another euro-zone countries banks will also explode in spectacular style, the warning signs of which will be made manifest in that nations bond markets. Know this truth - NO BANK Holds Funds to even pay out 1/10th of Depositors! In which respect I enacted my emergency Financial Armageddon plan last week, where the focus was to move funds from high risk euro-zone banks to low risk wholly UK owned banks. Everything went smoothly apart form one transaction of early Friday afternoon for £16,000 which has gone awol! The transaction was supposed to leave Santander early Friday afternoon and arrive at a small UK private bank in about 2 hours time (Faster Payment service). Whilst logging in later in the afternoon I could see that the transaction had been marked as having left Santander but there was no sign of arrival of funds at the destination bank. Now well over 60 hours later the funds have still not arrived, further more attempting to log into Santander since late Friday has resulted in the following maintenance message. The key message is stick to the depositor guarantee limits of Euro 100,000, £85,000 per banking licence. For countries such as UK the theft has been by STEALTH by means of high inflation that equates to approx 14% STOLEN from UK savers over the past 4 years i.e. the amount that savers have lost after REAL Inflation (CPI+1.5%) and Taxes (20%) as savings interest rates have been artificially depressed by the Bank of England so as to funnel wealth into the bankrupt banks and monetize the governments large budget deficit. All Cyprus is doing is stealing directly from depositors because as being in the euro-zone it CANNOT PRINT MONEY AND INFLATE as the UK and US have been doing. Forget all of the propaganda that spouts from politicians or its economic propaganda mouth piece the OBR. For the truth remains as I voiced right at the beginning that the coalition government would continue to increase debt, each and every year of the coalition government towards a target of £1.33 trillion by March 2015 which is set against coalition / OBR propaganda for paying down debt. The latest budget confirms this expectation that further reinforces the fact that Britain's debt trajectory is exponential i.e. rather than paying down debt Britain's debt mountain will instead continue to grow as public debt targets a trend towards 1.75 trillion by 2018 and this is after the fraud of Quantum of Quantitative Easing, which is where the Bank of England returns interest it earns on Government bonds it has bought back to the government which the Government then treats as income to reduce the deficit i.e. the government is paying itself interest on its own debt! Therefore the real debt mountain by the time of the next election will have been fraudulently made smaller by about £120 billion. What is the consequences of £120 billion of QQE fraud and an official debt mountain by the time of the next election of about £1.5 trillion ? What is the consequence of about £420 billion of extra fiat currency by the time of the next election hat will continue to be ramped by by at least £120 billion per year thereafter ? 2. 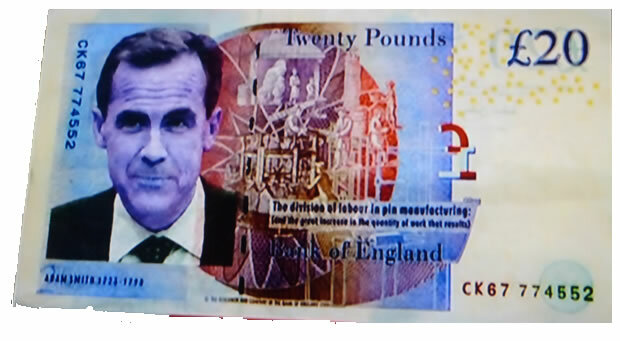 It calls for much more QE from the Bank of England to print money and BUY the debt to KEEP UK Interest rates LOW. What does this mean in economic terms? It means inflation is going to be ratcheted ever HIGHER as the Government is in effect stimulating the economy by nearly £500 billion! If the academic economist that populate the mainstream media actually understood economics then they would be shouting at the tops of their lungs of the consequences of £420 billion being injected into the economy by the time of the next election, which is GROWTH + INFLATION. Even on the official doctored inflation indices, UK inflation is expanding exponentially, the Bank of England inflation reports have repeatedly proved worthless as official inflation has come in over the past 5 years at 10% HIGHER than the Bank of England target! Many times I am asked in the comments section of the Market Oracle for a breakdown of my portfolio to illustrate my perception of future inflation impact on asset classes in that respect here are my portfolio's current and target trend trajectories. So clearly, as I have been flagging for much of 2012, I expect the 'stimulus' of £420 billion to increasingly find its way into higher house prices over the coming years and I expect UK interest rates to remain depressed which means cash will continue to lose out to inflation, especially following 'money printing' Mark Carney's take over at the Bank of England. George Osborne announced a series of additional measures in along stream of give away's aimed at inflating the UK housing market the most significant of which is the policy of zero interest rates which artificially depresses UK interest rates as a consequence of inflationary Bank of England QE Money Printing to the tune of more than £500 billion to date. An emergency £3 billion for infrastructure and house building to kick start growth. Interest fee home equality loans of upto 20% of a deposit upto £120k to help people buy new build houses which means house hunters only need to find a 5% deposit for a LTV of 75%! i.e. £10,000 up front deposit to buy a £200k new build on an 75% LTV mortgage of 150k (note loan is interest free for 5 years). The government will make available an £130 billion guarantee for new mortgages for properties upto £600k so that the banks will lend to more risky borrowers, i.e. 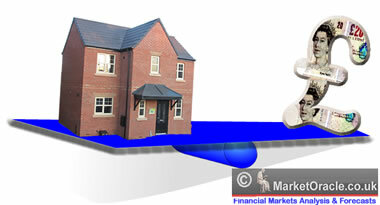 those without deposits to buy any new or existing build. This effectively means creating new mortgage / property demand of upto 200,000 per year (not clear if this excludes buy to let 2nd homes). The above measures are clearly aimed at ALL prospective property buyers / voters across the country, including London, therefore this IS a clear cut election bribe i.e. Vote Conservative because we are giving you £120,000 interest free for five years towards buying any house upto £600k! Other indirect boosts to the economy were also announced such as helping small business with a £2,000 NI Cut, and canceling the 3p fuel duty rise. If you have been reading my articles at the Market Oracle, then you will know that I have been flagging embryonic bull markets for the UK and US for virtually the whole of 2012 that I expect to accelerate into full blown bull markets during 2013. Whilst I have yet to get around to concluding towards a detailed multi-year trend forecast for UK house prices, see my earlier detailed analysis and concluding trend forecast for the US Housing market as an approximate interim guide for trend trajectory - 12 Jan 2013 - U.S. Housing Real Estate Market House Prices Trend Forecast 2013 to 2016. So this Budget makes a new offer to the aspiration nation. And what symbolises that more than the desire to own your own home. The deposits demanded for a mortgage these days have put home ownership beyond the great majority who cannot turn to their parents for a contribution. That’s not just a blow to the most human of aspirations – it’s set back social mobility and it’s been hard for the construction industry. 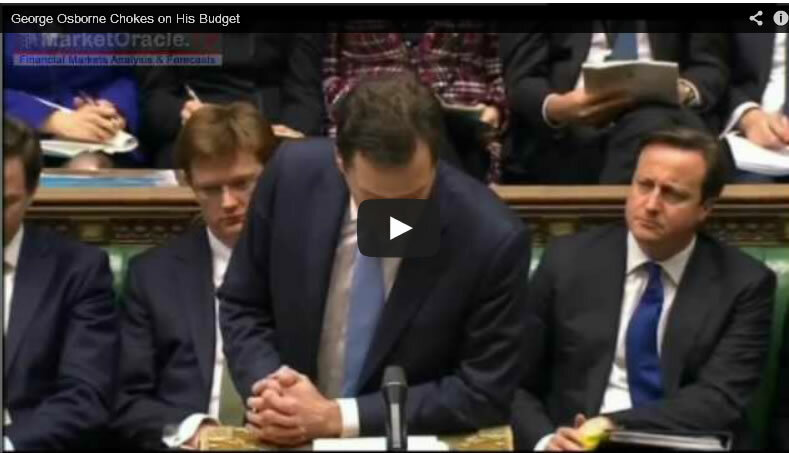 This Budget proposes to put that right – and put it right in a dramatic way. First, we’re going to commit £3.5bn of capital spending over the next three years to shared equity loans. From the beginning of next month, we will offer an equity loan worth up to 20pc of the value of a new build home – to anyone looking to move up the housing ladder. You put down a 5pc deposit from your savings, and the government will loan you a further 20pc. The loan is interest free for the first five years. It is repaid when the home is sold. Previous help was only available to those who were first time buyers, and who had family incomes below £60,000. Now help is available to all buyers of newly built homes on all incomes. Available to anyone looking to get on or move up the housing ladder. The only constraint will be that the home can’t be worth more than £600,000 – but this covers well over 90pc of all homes. It’s a great deal for home buyers. It’s a great support for home builders. And because it’s a financial transaction, with the taxpayer making an investment and getting a return, it won’t hit our deficit. We will offer a new Mortgage Guarantee. This will be available to lenders to help them provide more mortgages to people who can’t afford a big deposit. These guaranteed mortgages will be available to all homeowners, subject to the usual checks on responsible lending. Using the government’s balance sheet to back these higher loan to value mortgages will dramatically increase their availability. We’ve worked with some of the biggest mortgage lenders to get this right. And we’re offering guarantees sufficient to support £130 billion of mortgages. It will be available from start of 2014 – and run for three years. And a future Government would need the agreement of the Bank of England’s Financial Policy Committee if they wanted to extend it. Help to Buy is a dramatic intervention to get our housing market moving: For newly built housing, Government will put up a fifth of the cost. And for anyone who can afford a mortgage but can’t afford a big deposit, our Mortgage Guarantee will help you buy your own home. That is a good use of this Government’s fiscal credibility. In the Budget Book, we also set out more plans for housing: Plans to build 15,000 more affordable homes. Plans to increase fivefold the funds available for building for Rent. And plans to extend the Right to Buy so more tenants can buy their own home. Meanwhile George Osborne literally choked on his budget as he tried to suppress the underlying truth of an ever expanding debt mountain as the government prints debt to bridge the unbridgeable gap between that of government spending and revenues that feeds the exponential inflation mega-trend. The bottom line is this - At least George Osborne is trying to sort out Britain's economic mess when those that created the mess, Labour's response is to tax businesses, borrow and spend on an unproductive public sector black hole which would BANKRUPT Britain! The big picture remains as I have iterated countless time's which is one of exponential inflation, for further protection strategies see my latest ebook The Stocks Stealth Bull Market 2013 and Beyond (FREE DOWNLOAD). damn,......you would not short xhb if you believed the oracles 2016 peak in real estate.!!!!!!! Your comment illustrates the problem in that people's perception of what one has written is not the same as what one has actually written for instance the forecast is for the Case-Shiller House Price Index (CSXR), where does it say XHB or XLF? That is something you have plucked out of thin air. 25 Mar 13, 13:50 Cyprus Shows Your Savings Will be Stolen! "Cyprus Shows Your Savings Will be Stolen! 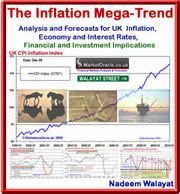 UK Theft is by Means of High Inflation". If your bullish on stocks then why not invest more than 22% by December ? Stock market investing is very high risk, as with the high potential reward goes the high potential risk of losses. For instance in December 2011 when I had about 40% in stocks and 60% in cash / bonds, I was at my most extreme level of risk in decades by virtue of the fact that the stock market had several years bull run behind it AND that if the euro-zone started to collapse most of my savings would be stolen, now with 50% of my wealth secure in property and stocks down to around 20% means I can now sleep well at night. The only way I can see my % of portfolio going up significantly above 22% is if there is an extraordinarily strong bull run for the remainder of 2013 that lifts existing values higher, as my focus remains to seek out investments in the property market as well as bio-tech. When I invest it's for the long-term so yes I am still mostly invested in the same stocks, as I cycle in and out of them. I add additional stocks after significant research where my focus for 2013 is on biotech and graphene, I am also hunting other categories of stocks namley developers of solar paint which I expect in 3-6 years time will be the next big gold rush! I see from this article that you are aiming to have 60% of your own money invested in UK property by the end of this year? What is the best way to capture the upside of this market without having to own physical bricks and mortar? I am targetting upto 5% in UK and global housing stocks. But for piece of mind, bricks and motar can't be beat. If I had 60% in housing stocks I would soon become a nervous wreck! I was thinking of Funds that aim to match or exceed the UK House Price Index. Are these a good/safe investment for a UK investors portfolio?